Explore custom mirror manufacturing products & shower door components with Frank Lowe's industrial team. Contact Frank Lowe for your fenestration needs. 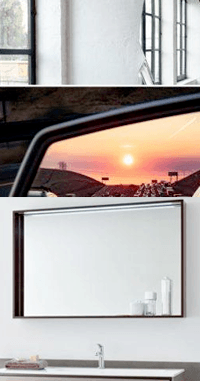 Since 1955, Frank Lowe has been delivering transparent solutions to companies within the mirror and shower door industry. We provide a wide range of high-quality products, innovative solutions, and world-class customer service with each interaction. We've built our brand on delivering on-time products, custom solutions engineered to exact specifications, and always being flexible and responsive to the needs of our customers. Whether you need separator pads, mounting tape, clear setting blocks, or any other mirror manufacturing component, the industrial manufacturing team at Frank Lowe is here to help. Visit our fenestration products page for our most recent product list. Even if you don't see the exact product or custom solution you need; simply let us know. We will work to provide a solution. While our in-house library contains a substantial number of dies, we are able to create new die cuts based on the specifications of your shower door product. All of our die cuts are crafted from quality materials because we believe shower door components are only as good as the materials used to make it. If you don't know the exact material you need, our experts will help you choose the best elastomer for your shower door component. Explore all mirror manufacturing products or shower door component options — especially the solutions you may have never considered. Pursue each option with a comprehensive cost-benefit analysis to determine feasibility. Create your mirror or shower door components with the best material within your budget. Whether you’re just getting started or have been in business for as long as we have, it’s never too late or early to partner with Frank Lowe. Let’s talk. We’re ready to listen. Contact the expert team of mirror manufacturing specialists and shower door parts manufacturers at Frank Lowe today. Not sure about the exact materials or specs required for your mirror component product application? Let's chat. We'll help you find the right solution. Are You Using the Right Materials For Your Mirror Component Product Application? Let's talk. We'll help you choose the right materials for your mirror component product application.